Margaret Blanche Welcher, 89, was born on March 31, 1929 in Russellville, Arkansas to W R and Lois McAnulty Shinn. She passed from this life to the next at the Russellville Nursing Center on Friday, March 22, 2019. She was preceded in death by both her parents, her husband of 63 years, J B Welcher, her son, Louis R. Welcher, an infant son, Carol David Welcher, 2 brothers, Leonard Shinn and Ira Shinn, daughter-in-law, Mary Welcher and a grandson, Clifford Scott Welcher. She is survived by a son, Clifford Welcher and wife, Rhonda, Malvern; 3 grandchildren, Richard Welcher and wife, Christi, Fayetteville, Brandie Staten and husband, John, Greenbrier, David Welcher, Russellville; 7 great-grandchildren; a sister, Mildred Findley, Russellville; and daughter-in-law, Candace Welcher, Russellville. Mrs. Welcher is also survived by 2 nieces, 6 nephews, their spouses, several grandnieces and grandnephews and a host of dear friends. The youngest of four children, Blanche grew up in the Bethel Community, where she attended the two-room school and the Bethel Church. Her parents taught their children the joy of singing gospel songs, the value of a loving family and hard work. She and J. B. Welcher married on April 12, 1946 in Russellville, after his war service in the Pacific. At the age of 18 she and J. B. began singing together in a gospel quartet in which she played the piano and sang alto. The group traveled together for many years in the Arkansas River Valley and her love of praise hymns continued throughout her life. 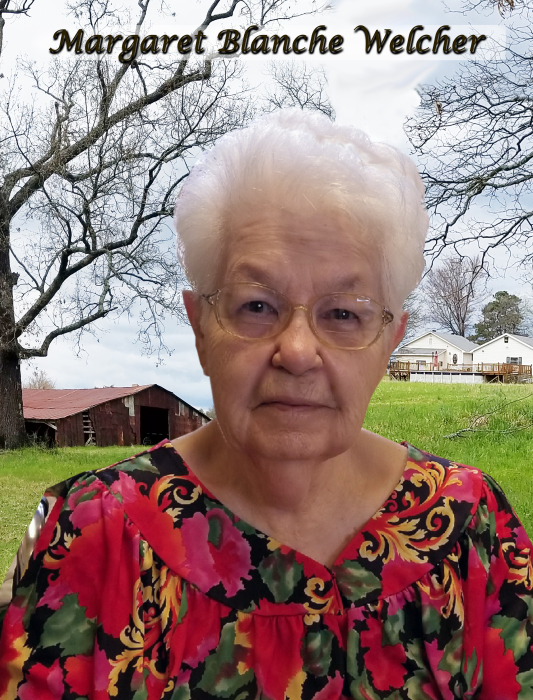 She worked for the International Shoe Company in Russellville for 25 years, retiring as a Supervisor, in 1979 and was a long-time member of the Antioch Free Will Baptist Church in Russellville. Funeral Service will be held at 2:00PM, Tuesday, March 26, 2019 at Humphrey Chapel. Rev. Fred Goates and Rev. Gary Duvall will officiate. Burial will be at Pisgah Cemetery in Pottsville, by Humphrey Funeral Service. The family will receive friends from 1:00 pm until service time on Tuesday, at the funeral home. Pallbearers will be Richard Welcher, David Welcher, John Staten, Peter Welcher, Luke Welcher, and Jacob Welcher. Memorials may be made to the American Cancer Society, c/o Judy Murphy, 126 Lakeview Circle, Russellville, AR 72802, or to the American Heart Association, 909 West Second Street, Little Rock, AR 72203. Internet obituary and on-line guest book are available at www.humphreyfuneral.com.